From the time of incorporation of V-Tech Communication in 2000, we are catering the expected needs and requirement of infrastructure and communication network of Enterprises and Telecom Sector. The diversified range we offer includes Fiber Optic Passive Components, Under Ground Utility Locator, Optical Test Equipment, RF Test Equipment, LCD Display, OFC Tools, Used Equipment and various others. The entire range of products is procured from the trusted vendors available in the market and this range is manufactured in line with the set national and international quality standards. Serving our client with the complete customized range of services, we are efficiently providing our services to a huge base of clientele across the globe including the various countries of Middle East, East Asia, Indian Subcontinent and South East Asia. To support the smooth and timely delivery of the products, we have developed an advanced distribution network, which is managed by qualified and experienced professionals. Our distribution network is equipped with the hi-tech devices and under electronic surveillance to create a proper communication while transferring the products from our warehouses to the desired destinations. Guided with the innovative thinking of Mr. Krishankant Gupta, founder of the company, the firm has achieved the new heights of success. The available resources are to be used to an ultimate extend, is his philosophy to climb the stairs of success. His years of experience in telecom industry, help the organization to create a unique solution for the communication networking. We believe in providing work environment that is employee-friendly so that our staff can work with their maximum efficiency and can serve our clients with the world class services and products. Trading of Fiber Optic Passive Components, Under Ground Utility Locator, Optical Test Equipment, RF Test Equipment, LCD Display, OFC Tools etc. Vices that are procured from reliable vendors across the globe. We have established a specious and well maintained warehouse to keep the products safe and secure till the time of making them available in to the market. Besides that we have in-house testing unit for undertaking a stringent test on procured products from incoming to the final dispatching. 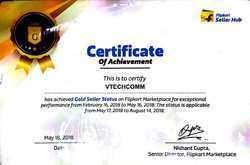 we have achieved a gold seller status on flipkart market place for exceptional perfomance . Our client centric organization in committed to render maximum clients satisfaction by offering them with qualitative range of networking and communication devices and services related to networking solutions at cost effective prices. Owing with the widespread network system, we deliver the product with the utmost safety with in stipulated time duration at customer doorstep. We customized our networking solutions as per the client’s specifications to ensure the best servcies to them. We are recognized as a reliable name in the Telecom and Communication Sector. Our products are procured from some of the reliable suppliers and vendors across the globe which ensures that the range that we offer is qualitatively superior. Our success is a result of the dedicated and endless efforts of the skilled and qualified team of professionals. This is the reason we are at the pinnacle of the success and try to maintain this enviable status with keeping our promise to offer a qualitative range of products and services. An aspired team of procuring agents is engaged in the developing a reliable base of vendors and working to maintain amiable relations with them. This team posse in-depth knowledge about the procuring process to ensure the superior quality and highly functional array of networking products is to be sourced from vendors. Supported with the highly modernized infrastructural facilities, we have successfully export our entire range to various countries of East Asia, South East Asia, Middle East and Indian Subcontinent. We offer customized solutions to our prestigious clients regarding the communication networking that are completely complying with the global standards. Serving to a huge base of clients in Telecom and Communication Sector and the various operators enjoying our services are Punj Lloyd Ltd, Fujitsu Optel (Fotel), Bharti Airtel Limited, TATA Telecom Ltd and many others. Owing to the great experience in the Telecom and Communication industry, we offer the innovative range of networking and communication devices and customized networking solutions with in stipulated time frame. We are efficient enough to meet the bulk orders from our customers as we are backed with the advanced warehouses and hi-tech procuring systems. The entire range is procured from trusted vendors by our skilled procurement agents to ensure the finest quality of the products.